SAVE OUR SCHOOLS! 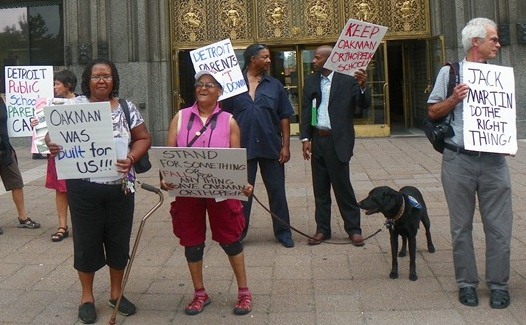 SAVE DETROIT’S OAKMAN AND SCHOOL OF THE ARTS! Some of the supporters of Oakman Orthopedic who ralled to save the school and stop school closings nationally on Aug. 28, 2013. State School Board member Marianne Yared McGuire (l) with others at rally to stop school closings Aug. 28, 2013. DETROIT – As outrage swells across the country about massive school closings and cutbacks, the Detroit Public School (DPS) system, the first to begin its own tidal wave of closings in 2006 with the shut-down of 50 schools, continues to wield a wide-swinging hatchet under “emergency” dictatorship. 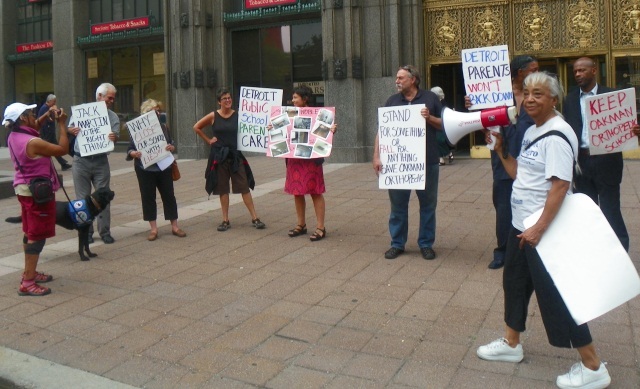 Dozens turned out in front of DPS headquarters at the Fisher Building Aug. 28 to join other cities in a national call for a moratorium on school closings. They advocated in particular for the state-of-the-art Oakman Orthopedic School, built to accommodate the needs of uniquely disadvantaged children. “Save our Orthopedic School, save our neighborhood schools,” protesters chanted, adding, “Hit the road, Jack and don’t you come back no more!” referring to Michigan Gov. Rick Snyder’s newly-appointed DPS Emergency Manager (EM) Jack Martin. A cacophony of car horns greeted their chants. DSA students approach stage angrily during meeting with DPS EM Jack Martin and others Aug. 28, 2013. Martin has refused to meet with parents at Oakman, but that evening, parents and students at another state-of-the-art institution, the Detroit School of the Arts (DSA), forced him and DSA officers off the stage briefly. 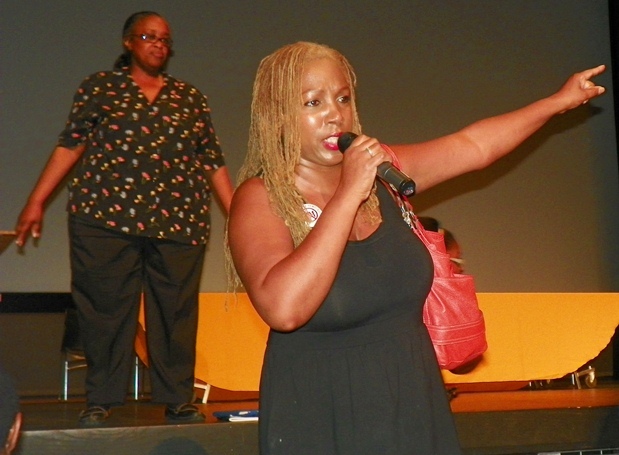 The large crowd erupted in outrage at the proposed lay-offs of skilled teachers, arts curriculum cutbacks, and the appointment of a new young white male principal in place of the Black women who previously held that job at DSA. The DPS Deficit Elimination Plan for 2013-14, signed by former DPS EM Roy Roberts, says the district plans to close 28 more schools from 2014 to 2016. DPS has been decimated by closures for nearly a decade now, with state per-pupil aid siphoned off to charter schools, 13 schools in the state-created Education Achievement Authority, and the district’s debt to the banks. Aliya Moore, president of Oakman Tiger Parents Club. Keep the Vote No Takeover leader Helen Moore is in background. During the 2013-14 school year, DPS set aside $107,261,000 for that debt, taken out of $350,285,000 in state per-pupil aid, according to a letter DPS sent Aug. 15 to the Bank of New York, which oversees the payments. See DPS Set aside requirements 8 15 13. 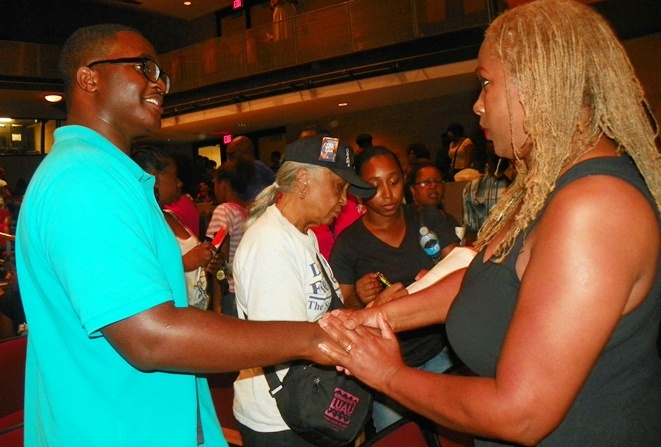 Aliya Moore, President of the Oakman Tiger Parents Association, told VOD that Martin has refused to keep Oakman open despite recommendations by both the Detroit and Michigan Boards of Education. Forty percent of Oakman’s 300 children have severe disabilities which the school was built to accommodate, with accessible entrances, a single floor layout, rooms for diaper changes and catheterizations, and a wheelchair accessible greenhouse and playground. 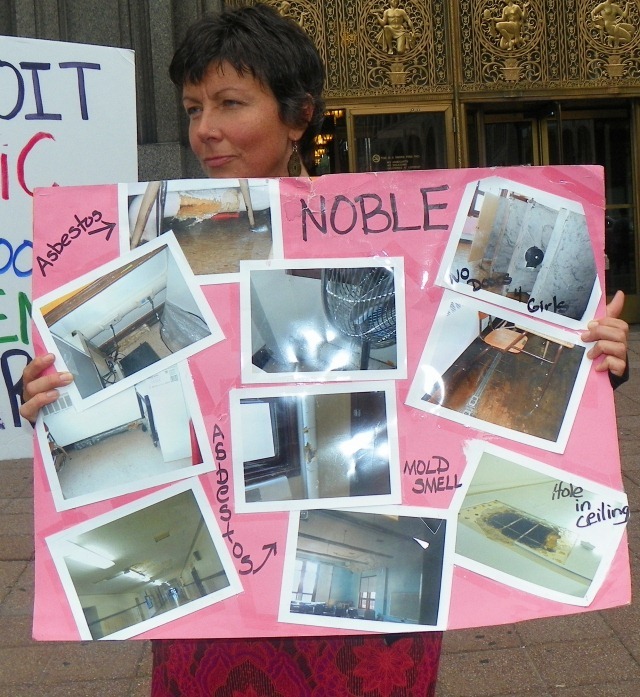 Photos of conditions at Noble are displayed during protest. Marianne Yared McGuire of the State Board of Education attended the protest, standing next to a woman with a poster plastered with photos showing deplorable conditions at Nolan. 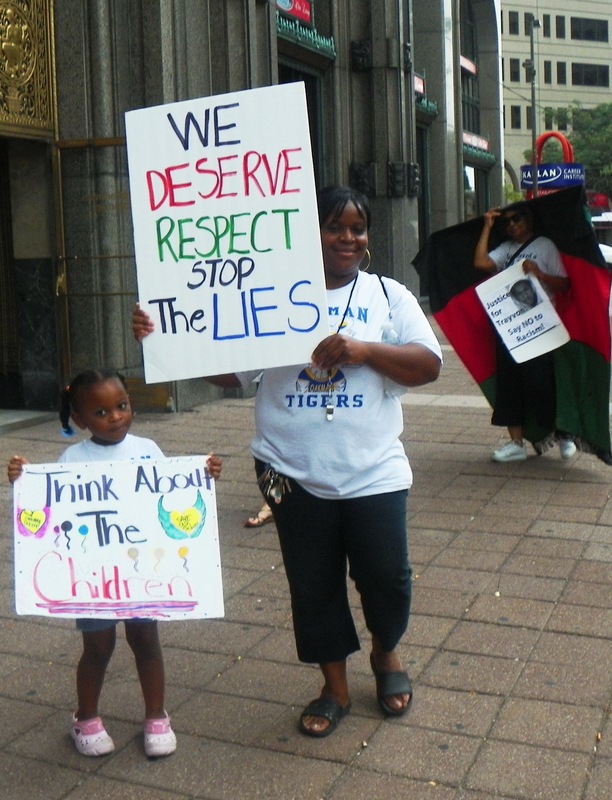 Sixty Oakman parents and children traveled to Lansing to meet with the MDE last month, according to another protester, but personnel there told them no one was available when they arrived. She said the MDE never called them back or sent an email. “They’re supposed to serve us because special ed is totally supported with state and federal tax dollars,” she declared angrily. Lamar Lemmons is president of the Detroit Board of Education, which the state has stripped of most of its powers. More protesters kept coming. Cynthia Lowe and Marguerite Maddox (with helper dog)are at left. For more information from Journey for Justice, which sponsored the national day of protest against school closings, go to Journey for Justice fact sheet. 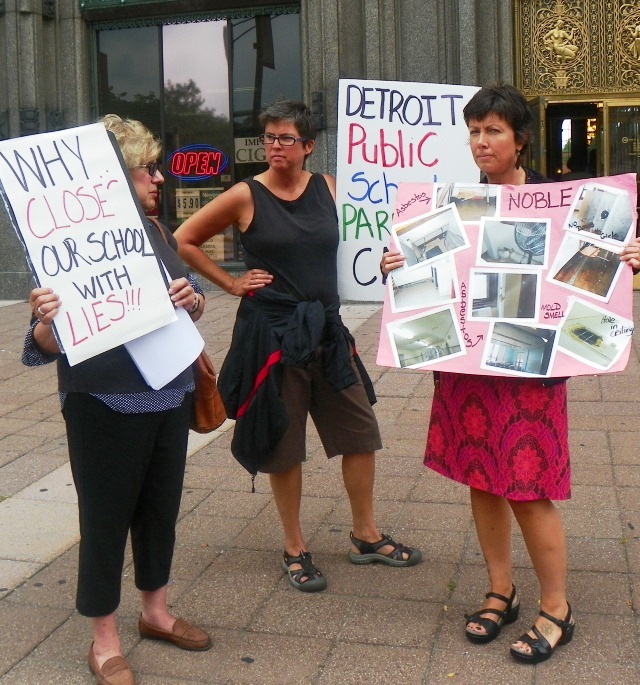 Also see http://voiceofdetroit.net/2013/08/26/detroit-joins-natl-coalition-to-call-for-moratorium-on-school-closings-rally-wed-aug-28-3-pm-dps-hq-fisher-bldg/. At DSA, parents and students at a packed meeting erupted in anger when officials announced that the only discussion of proposed cuts would come from questions submitted on cards. The officials said only six questions from the cards would be addressed. The school’s new principal, Robert Harvey, showed slides and claimed that DSA is running a $5 million deficit due to decreased student enrollment. Lay-offs and cutbacks in the arts curriculum were abruptly announced the week before schools opened. DPS Superintendent Karen Ridgeway speaks as DPS EM Jack Martin (next left) listens approvingly. As EM Jack Martin sat by, smiling in approval, Superintendent of Academics Karen Ridgeway claimed that DSA had previously been allowed to have 30 teachers although its student enrollment of 500 qualified it for only 21. She said the school must return to its previous enrollment of 750 to 800 students to regain staff, and announced that applications were being handed out. 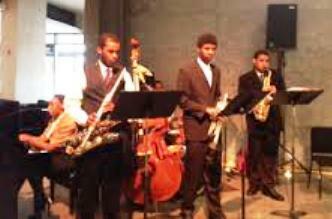 Eight teachers were slated for lay-offs, with the band and music tech programs among others cut. Audience members at DSA meeting begin rising in protest. The minutes of the DSA Governing Council for April 15, 2013, state that the “Governing council was told that budget for next year would not change. They were also promised no ‘sweeping layoffs.’” Go to DSA 2013 4-15 Minutes_Approved_FINAL for full minutes. 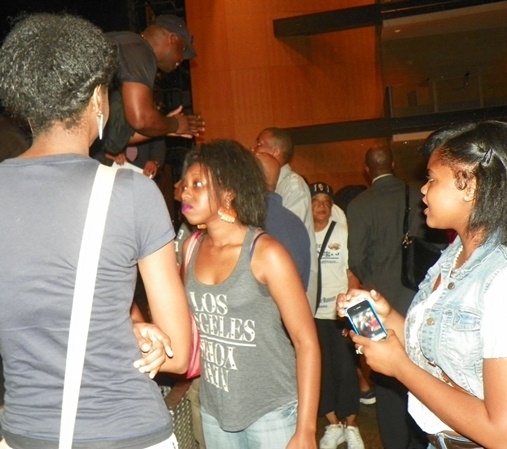 Martin and other DPS officials rush off stage as crowd gets angrier. 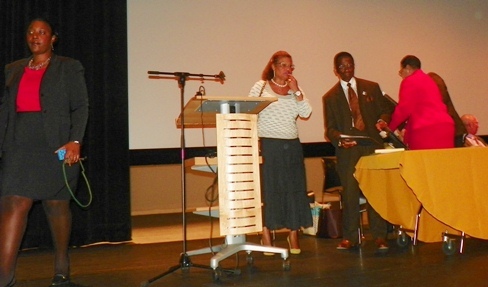 Helen Moore challenges Martin and DPS officials during DSA meeting Aug. 28, 2013. The article estimated investors in the $92 million bond would earn 4.5 percent instead of the normal 0.18 percent, meaning millions more siphoned off to the banks from the DPS budget. 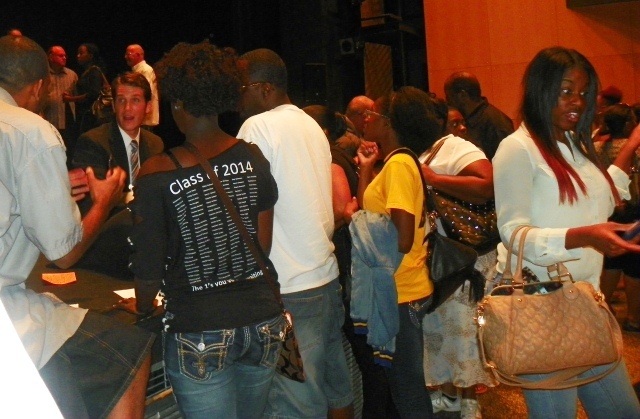 After return to stage, DSA Principal bends down to hear students’ protests. 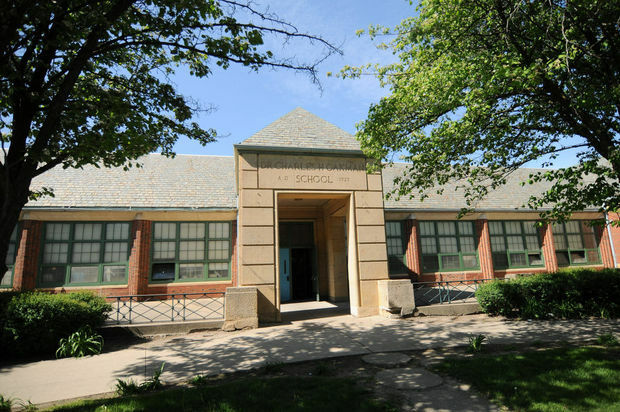 DSA is one of nine “self-governing small high schools,” with 2,800 students, according to the district’s 2013-14 Deficit Elimination Plan. Go to DEP DPS 2013 14. Members of the Governing Councils are appointed. During the meeting, parents and advocates said the governing council is virtually non-functional and demanded that it be disbanded and the school be returned to regular DPS status. They asked that all lay-offs and curriculum changes be canceled immediately. Natasha Baker read off questions from the cards, each of which elicited loud applause from the audience. DSA Principal Robert Harvey (r) refused to talk to VOD at end of meeting. “Why was a new principal chosen and no one else interviewed,” asked one individual. 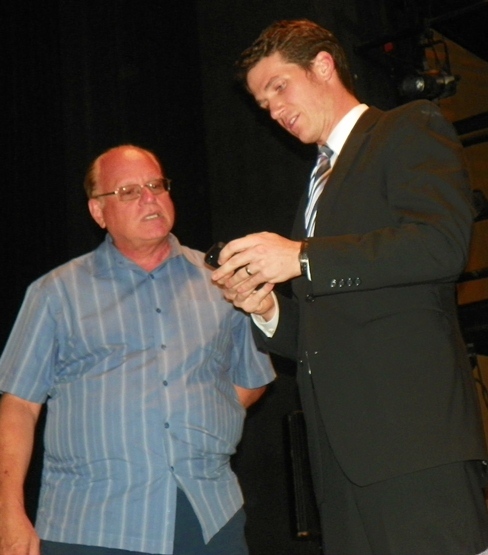 Ridgeway claimed there were interviews, but an audience member declared that a lie. “What is going to happen to our talented staff?” asked another individual. Ridgeway replied that they are being transferred to other schools. 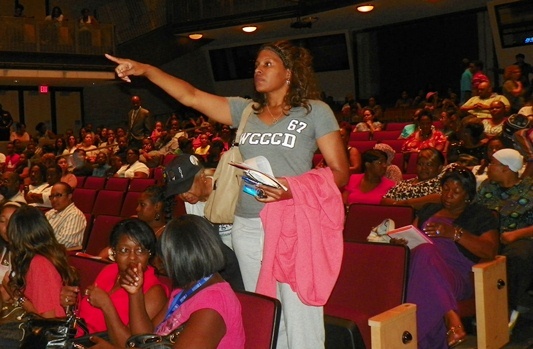 Anger from parents and students in the meeting continued to rise. Shortly afterwards, Martin, who had been silent, and other officials left the stage briefly while a parent of their choice, Cheryl Valentine, took over. She asked the audience to work with the EM and take applications for more students. 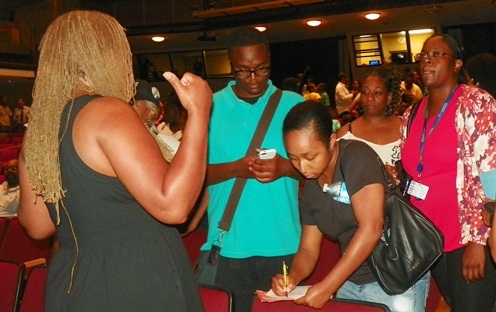 She asked parents to sign up with the Detroit Parent Network, an organization set up by private organizations including the Skillman Foundation. 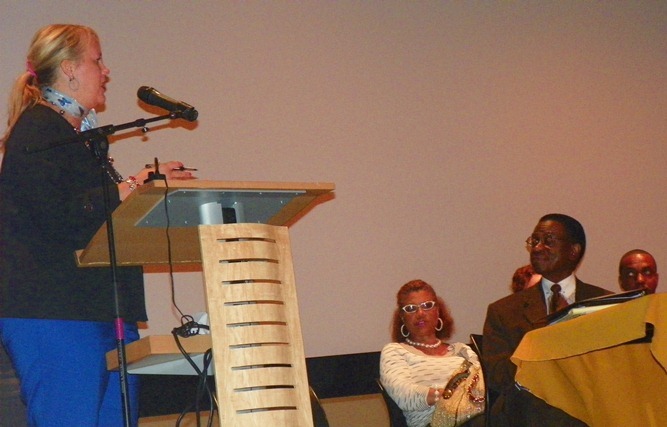 Parent Christal Bonner addresses audience as former speaker, Karen Valentine, listens from stage. Bonner is pointing to principal and others cowering in a corner of the stage. Parent Christal Bonner then took the mike. DSA students and parents flock around Christal Bonner to sign petitions demanding no lay-offs, no curriculum changes, return to DPS regular status. Parents and students flocked around her to sign petitions based on demands she presented, including restoration of all teachers and a full arts program, and return to regular DPS status instead of the “self-governing” model. She and Moore called on the audience to attend rallies at DPS headquarters Aug. 29 and 30 to present the petitions to Martin. 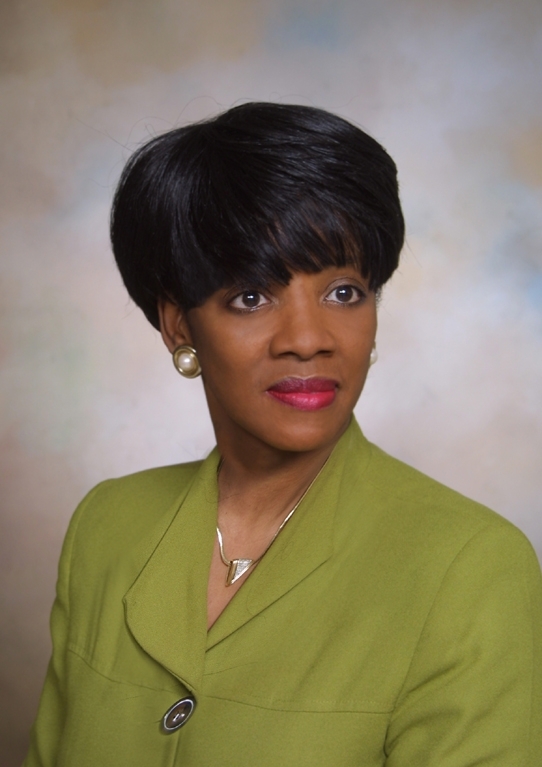 Bonner said the DSA format was based on that of the Booker T. Washington School of the Fine and Performing Arts in Dallas, Texas, the only other school of its kind in the country, except for Interlochen in Michigan. 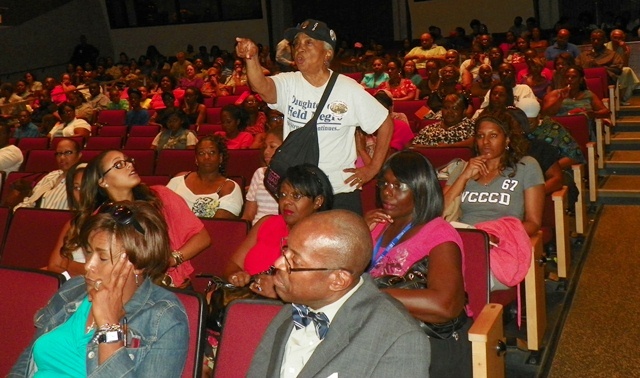 “They don’t want too many of US there, and it’s a private school,” Bonner declared. DPS EM Jack Martin, guarded by police and staff, kneels to talk to parent. “The decision to make changes to the number of instructional positions at Detroit School of Arts is being reviewed by Detroit Public Schools Academic Leadership and Emergency Manager. It is anticipated that, going forward, staff changes of this nature will also be reviewed with representatives of the school’s Governing Council. 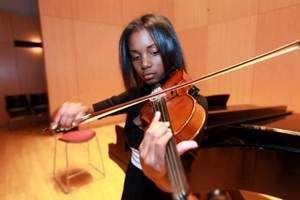 Detroit Public Schools remains committed to supporting not only the Detroit School of Arts, but also adding arts/music enrichment back to all of our elementary and middle schools for the 2013-14 school year. 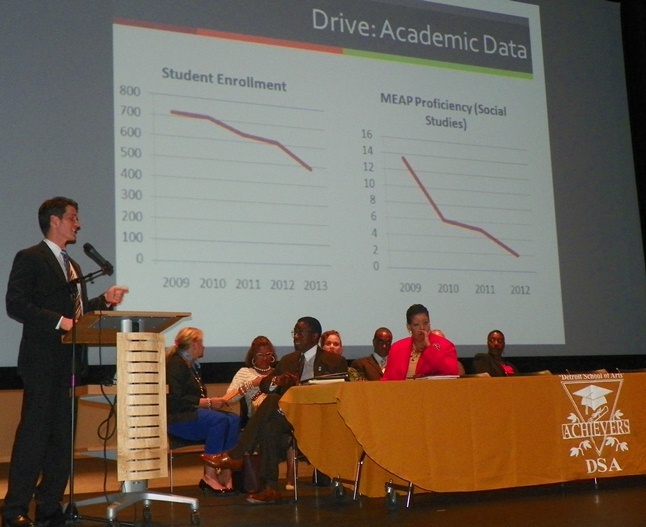 DSA Principal shows charts showing alleged enrollment and achievement drops. Detroit School of Arts (DSA) was designed to provide enriched academic arts opportunities for students under the tutelage of high quality academic arts instructors. DSA was founded on the principles of leadership integrity and community engagement. These two qualities helped advance DSA into national and international acclaim. It is difficult and painful to learn about the disruption of DSA’s educational attainment, which began by removing the school from under the auspices of the Detroit Public Schools and forcing her to exist in an unwarranted aggressively inadequate autocratic governance structure. Regretfully, providing a high quality education to DSA’s students was replaced with a regressive ideology of immobilizing educational advancement. It is disconcerting to learn about the educational bureaucratic practices and processes that silenced the community’s voices by denying them democratic participation in selecting the school’s leadership. DSA’s positive school climate and culture suddenly became a cesspool for incompetent competents imposing a villainous will on students, parents, teachers, and staff. The most pejorative act to DSA’s academic integrity is the recent displacement of stellar teachers with impeccable professional records. There is no sound or appropriate rationale to justify these displacements. Detroit Public Schools is in a position to correct a wrong that resulted in harming DSA, which is held hostage under a depreciatory governance structure, unqualified school leadership, and an amputation of first-rate arts instructors; specifically, N. Burrell, M. Malabad, and C. Malabed. The demise of the DSA’s educational programs and removal of exceptional instructors is unjustifiable and reprehensible. The current autocratic school governance structure appears to produce despondently inept and deceptive leadership decisions that fail to advance DSA’s mission and vision. To reconcile these issues, it is of paramount importance and urgency to begin to restore DSA’s credibility by re-instating DSA to the Detroit Public Schools and re-instating the displaced teachers. DPS can support DSA by acting immediately to remove the school from an existing ineffective, unqualified, disorganized, despotic governance and school leadership structure that has diminished and harmed DSA’s school community and paralyzed thriving programs. Furthermore, DPS can immediately re-call the displaced teachers. The ramifications and repercussions of ignoring the requests of DSA’s school community could continue to impair the learning experience for students and impede DSA’s growth. Support is needed (at this time) to save not only the institution but the future of the citizens of Detroit. One only need to be reminded that there are four things that help construct a society: laws, education, religion, and the arts. Failure to save DSA, an institution that has proven to instill arts within the Detroit community, will be judged historically as another step in the genocide of Detroit’s culture. Maulana Tolbert (313)-341-5929 and detroit.nlc@gmail.com. 2 Responses to SAVE OUR SCHOOLS! SAVE DETROIT’S OAKMAN AND SCHOOL OF THE ARTS! THIS IS NOTHING MORE THAN “AN OUT AND OUT WAR” AGAINST “DETROITERS” AND “ANYONE ASSOCIATED WITH US” !!! IT IS NOT ABOUT MONEY, DETROIT IS NOT BROKE !! IT IS NOT ABOUT “SKILLS and GRADE POINT AVERAGES DPS SCORES ARE BETTER THAN THE “CHARTER”, and “THE JEB BUSH / ROMNEY E.A.A. 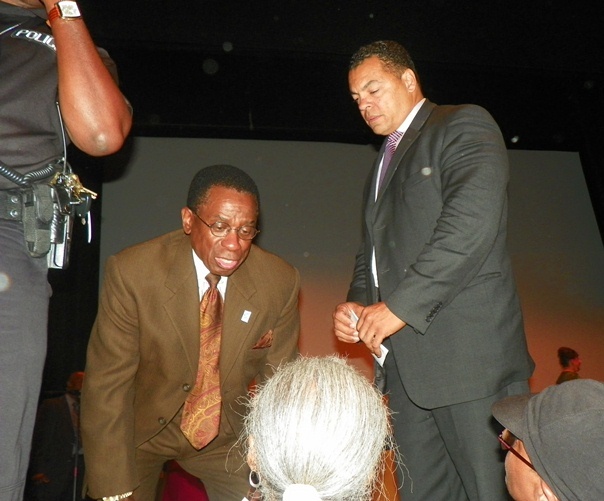 SCHOOLS” (“AN EDUCATIONAL TESTING PLAN BEING TESTED IN DETROIT ON MINORITIES”) !! HISTORY SHOWS THAT THIS WAS A PROCEDURE CONDUCTED ON MINORITIES A LONG TIME AGO BUT THEN “THEY” SAID IT WAS FOR “MEDICAL REASONS” ??? Note; ALL OF THE “BLACK PATIENTS” DIED OF “VENEREAL DISEASE” ??? “No SURVIVORS” !!!!!!!!! IT IS NOT ABOUT “MAINTENANCE OF THE BUILDINGS”, THEY HAVE FUNCTIONED FOR YEARS DESPITE OF BUDGET CUTS !! WHAT COULD IT BE ??? LET’S SEE ??? “IT” MIGHT JUST BE THE FACT THAT “DETROIT” SITS AT “THE MAIN FRESH WATER ENTRANCE TO THE “DETROIT RIVER” AND THE 1% WILL NOT STAND FOR A CITY OF “MIXED CULTURES” TO HAVE A MAIN SAY IN WHAT PASSES UP AND DOWN “THE DETROIT RIVER” ?? COULD IT BE THAT AROUND THE ENTIRE WORLD EXCEPT HERE IN DETROIT THEY REFER TO “WATER (H2O)” AS “BLUE GOLD” AND “THE NEW ENERGY” and “FOOD PRODUCTION” (Hydroponics) SOURCE OF THE FUTURE ??? COULD IT BE THAT THE ASSETS, “EDUCATION”, “STRUCTURES”, “POWER PLANT”, “WATER PLANT”, “AIRPORT”, “INFRASTRUCTURE”, “TRANSPORTATION SYSTEM”, “WORLD FAMOUS HISTORIC NAME RECOGNITION”, and “LOCATION” ARE TOO IMPORTANT TO THE EVERY DAY LIFE OF “THE CURRENT RESIDENTS” TO BE LEFT “NOT CONTROLLED BY DICTATORS” ??? TO PUT STOPS AND ROAD BLOCKS ON “PUBLIC EDUCATION” AND IN THE SAME BREATH SAY THAT THE “PUBLIC SCHOOL STUDENTS” ARE “LESS ACHIEVERS” THAN THOSE OF A SYSTEM THAT CANNOT PRODUCE DOCUMENTS TO PROVE THEIR CASE IN A “FAIR”, “JUST”, “COURT OF LAW” ???? IF WE THE CITIZENS OF DETROIT ARE TO “RESPECT LAWS” THEN “THE DEFINITION OF LAW” MUST BE WRITTEN FOR ALL TO FOLLOW, NOT TO JUST BE OVERLOOKED BY THOSE WHO WOULD “DARE TO COMMIT / CARRY OUT” THESE “UNLAWFUL ACTS” THAT “MUST” BY “LEGAL DEFINITION” BE REFEREED TO AS “ACTS OF TERRORISM” AND ARE IN “DIRECT VIOLATIONS” OF ***”THE FEDERAL PATRIOT ACT’***. THE STATE CAN SQUALLIER ALL IT WANTS. BUT WHEN YOU (The State Of Michigan) MESS WITH AND DENY “PUBLIC EDUCATIONAL ARTS / SKILLS” AS OPENLY AS THE STATE HAS IN DENYING CLASSES TO “DAVIS AEROSPACE TECHNICAL HIGH SCHOOL”, AND “THE DETROIT SCHOOL FOR PERFORMING ARTS”, “OAKMAN SCHOOL OF ARTS”, and “OTHER SCHOOLS”, THEN “THE STATE Of MICHIGAN” IS GUILTY OF ALL OF THE CRIMES MENTIONED IN THIS STATEMENT !!! P.S. “I” HOPE THIS MAKES IT ALL OF THE WAY TO “THE WHITE HOUSE” ??? Thanks for keeping me in the loop, Diane. This is an outrage. I’m sorry but the principal of the Detroit School of the Performing Arts is a joke. He doesn’t have a clue. The DSA is Detroit’s answer to Fame. And the students of Oakman School are being treated like second class citizens.